Grant Pearson, a Professional Engineer and the Vice President of Business Development for an arctic construction company, lives with an inherited, degenerative eye disease called Retinitis Pigmentosa. The CNIB referred Grant to the Neil Squire Society’s Technology@Work program, which supports people who have a work related barrier due to a disability or a physical limitation and who require Assistive Technology for employment or volunteer activities in British Columbia. “He was pretty certain about the product that he was interested in,” says Technology@Work Occupational Therapist, Katrina Tilley, who worked with Grant. 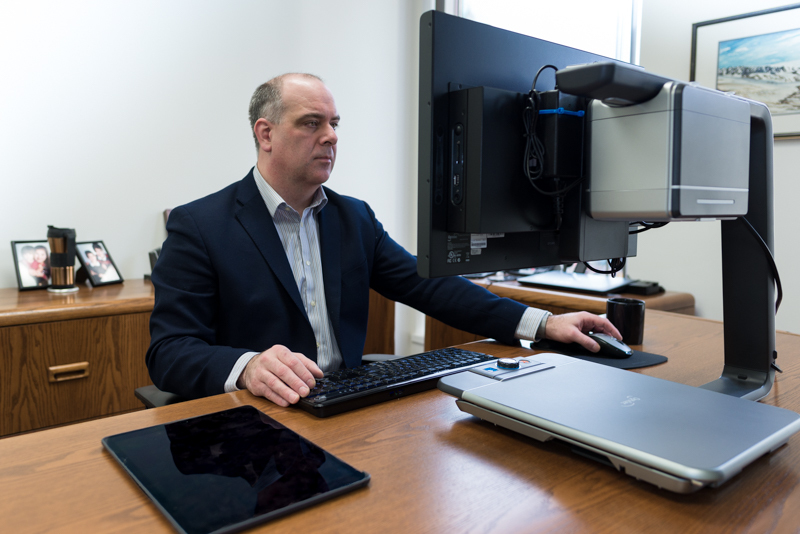 “He didn’t feel he needed to look at other options.” Grant had singled out the Optelec Desktop Video Magnifier as a tool that could assist him with his work, and the Technology@Work program was able to help fund the device through a cost sharing agreement. If you or someone you know in British Columbia could benefit from the Technology@Work program please call 1.844.453.5506 or visit www.BCTechAtWork.ca. This article originally appeared in the Spring 2017 issue of Abilities Magazine.